Do you rememeber Gauntlet? Well if you're and old git like me you do. When it hit arcades in the mid eighties, it was a huge draw. It was one of the first modern four player games, and you could either played with your mates or else threw your 10p in with some strangers. 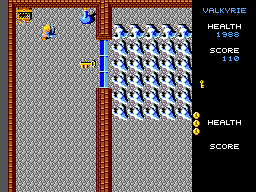 Gauntlet casts you as either a warrior, valkyrie, elf or wizard and had you trawling a neverending dungeon maze. Viewed from a top-down perspective, you shoot monsters, destroy the generators that spawn them, collect keys ("to open doors") and food to increase your constantly declining health. There's also power-up's to be found by the eagle eyed. Each character has a strength and a weakness (warrior - tough but slow, elf - low armour but runs fast) so there was a >little< stategy.. Also the game would comment on players status intermittantly "valkerie is about to die" and let players know when the games rules were changing "shots do not hurt other players...yet". Generally if you played with friends, you played as a team, but when you threw your lot in with other kids in the arcade invariably it was every man for himself when it came to food and potions (sneaky people picked the elf so they could scoot ahead and snarf the food first!). Well it's almost perfect. Almost, in that if you only have one friend you're all set if a bit lonely I guess). If you're popular and you want to play as a team with three of your mates like the arcade, well think again. 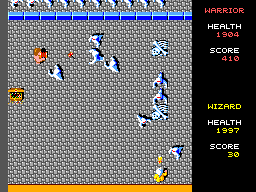 Gauntlet here is TWO player (the sms is a 2 controller console so anything else would have been a bit tricky!). 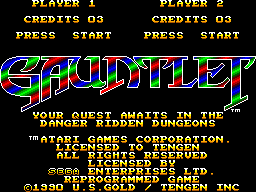 Also unlike the Arcade where you can pump coins in to stay alive , Gauntlet has three continues, (or six in a one player game if you start as player two on the last few hitpoints of player one's third credit). Otherwise it's all there, all the gameplay of the arcade, the transporters, the same grunts (bad guys) Death (almost unkillable and he drains your health, ouch! ), the whole shebang!. The treasure rooms (timed runs of a level with no enemies, one exit and treasure to pick up for points) are there too, hell! even the Arcades "cheat" works (Dont shoot for about a minute and all doors disapear, after 3 minutes all walls turn to exits, it was put in the arcades to help "stuck" players). The graphics were apparantly adjusted to suit the SMS's pallette, but it looks very well done. Everything from its arcade originator is perfectly recognizable. It even keeps the Arcades Gauntlets "stats at the side" layout. Other than a brief burst of music at the start and the countdown tune in the treasure room theres very little here. What there is though is well done. Sound effect wise it replicates the original very well, but it's missing the famous synthised voice saying such gems as "wizard needs food badly" etc, these are displayed as comments on the screen. In fairness the game doesnt suffer too much from the loss of these samples, and it probably would have been a bit of a stretch to include them on the cartridge. Very responsive (well unless you play as the slow Warrior , but as the programmers love to say these days that's "working as intended!). D-Pad to move, B to shoot, A to use magic (i.e. a smart bomb). High, if memory serves the first 8 levels are fixed, after this they are random (as was the arcade) to the best of my knowledge it doesnt end, ever. The game will just loop levels. As I mentioned before, unlike the arcade you dont have infinte continues so using 3/6 credits makes it a challenge to see just how far you can go. Master system's Gauntlet was probably the closest conversion to the original arcade experience, at least until Gauntlet IV had a release on the Megadrive/Genesis a few years later (it supported four players). As a non SMS owner at the time (for shame!) I actually bought a Powerbase converter for my Meg' back in the early Nineties solely to play it!